Another website goes live for a new business startup in Halifax. I am happy to show you a new website I have built and launched for a new business startup in Mytholmroyd, Halifax. It’s called Playtopia. 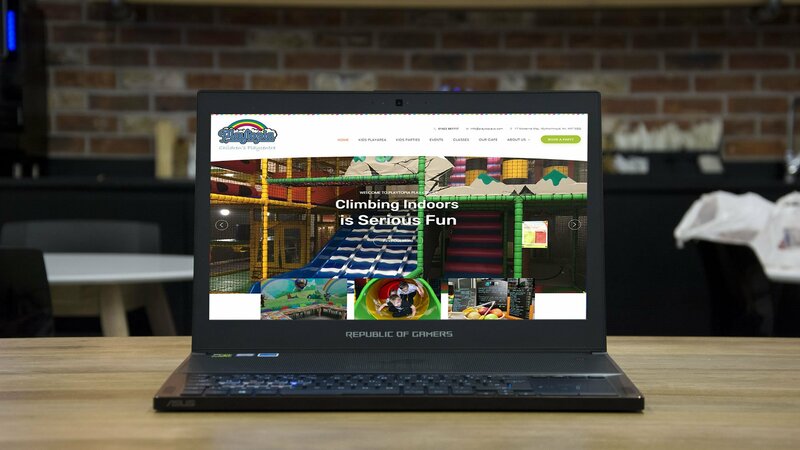 An indoor play centre for children that includes a huge climbing area, slides, the best baby sensory and toddler area in Yorkshire, as well as a fabulous deli cafe with amazing fresh roasted coffee! If you have kids, then you’ve gotta go for a visit. Most of my web design work comes from word of mouth, the best form of marketing you can get in my opinion. So it was a great pleasure to get a phone call from Becky asking if I could visit her and have a chat about a new website they needed. Of course, I said yes. Becky was starting with a clean sheet of paper, which was a great start. I listened to everything she had to say about what the new business was about, what ideas she had for the website, what type of colours to use etc. At the same time, I contributed with some recommendations and suggestions. What had worked for me in the past, and what tends to not work on a website. Have you a name for the business? Usually new startup’s already have their business name set in stone. Domain name – Once the business has a name, is the domain name available for the website? Have a search using any domain name registrar. www.123reg.co.uk is as good as any other provider to search for domain names. But I probably wouldn’t use them to host your website or email service. It might be cheaper than others out there, but their customer service isn’t that great! I’d use a smaller service provider. If you would like any recommendations, then get in touch. In this instance, playtopia.co.uk and playtopia.com were already taken so adding ‘uk’ to the end of the domain name worked – playtopiauk.com. What colours are you going to use? I would recommend using the same colours through out the whole business. Keep the same colours for your logo, business cards, stationary, website and merchandise. This way, customers will recognise you and your brand instantly without having to think about it. I’d also limit the number of colours to use. For Playtopia, 4 main colours are used. Now, this is quite a lot of colour for a website, but due to the nature of the business, and targeting young children, then bright colours work very well with this brand. On the flip side, the more colours you have, the worse the website usually looks. Make a list of all the information you would like to include on the website for visitors to find. Then group this information into web pages. Having too many web pages with little bits of information on them is harder to find than a longer ‘About Us’ page. If you provide many services, have one core service page then use a clear navigation to show secondary services page information. Take a look at your competitors. What information are they displaying? How are they displaying the information? What colour schemes are they using? Do you like how and what they are doing? What would you layout your website that’s better than your competitor? What don’t you like about your competitors websites? Take a look at other random websites out there. I guess that there must be millions of websites to look at. Make a list of website designs you like. Also make a list of websites you don’t like. These lists are very helpful to a web designer. Some websites are very dull and boring, others are too busy and you can’t find anything. Upon my return to show Becky the first draft of the website, the business had started operating for the school holidays. So time was an an essence. Becky and her colleagues loved the use of the colours and fonts used throughout the site. Which was great to hear. We set to work going through the draft web site. I listened intently and wrote down all the design tweaks needed, text copy that was missing. And finally asked for a few more photos. You can never have enough photos! Even if you can’t afford a professional photographer, a good quality smart phone can do the job ‘nearly’ as good. When researching competitors, I found one website that had a ‘Take a peek inside’ section. This showcased a number of photos together in a block format. To me, it instantly gave the customer a clear impression of the premises, the climbing frames, kids having fun and smiling. 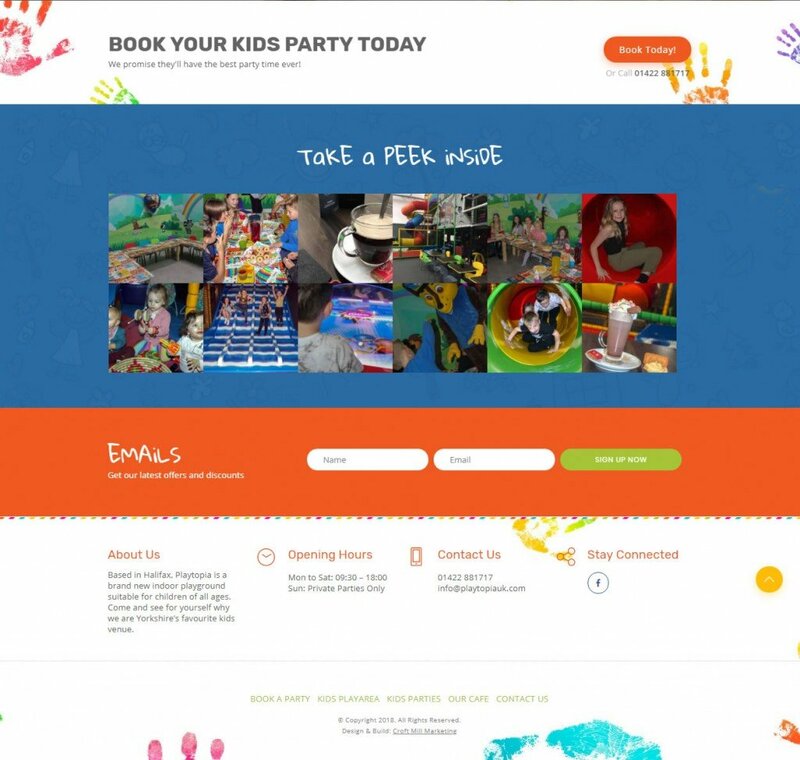 The Playtopia website needed to be very visual with the use of many photos. I thought it was perfect to use the same idea on this website. And highlight this section using the same colour blue used in all the text headings (see image below). As well as designing and building the website for Playtopia, I also made sure their website was indexed properly. Many developers can put together a website for you, but they tend to walk away on to the next customer. I make sure all the boxes are ticked. I can get the website on to page one of Google. Everyone wants to be one page 1 of Google right! So having a good keyword analysis report will certainly help you move in the right direction. Do you have a new business venture that needs a new website design? Get in touch and I would be more than happy to help.